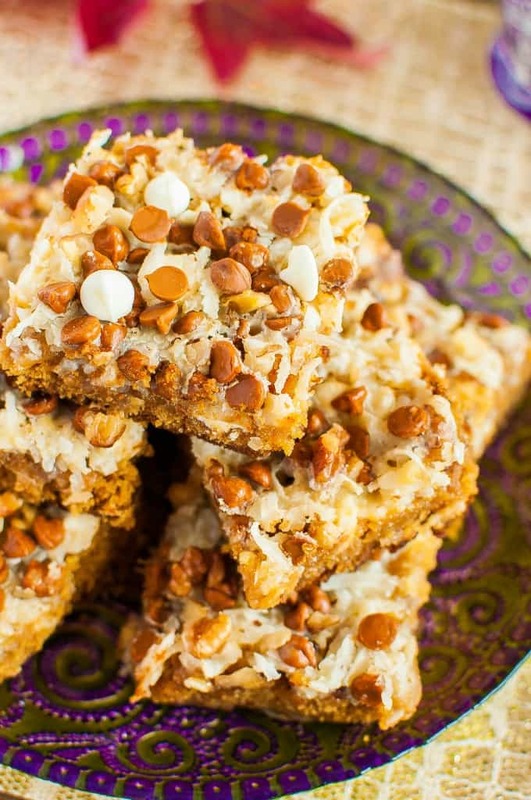 Pumpkin Spice Magic Bars are similar to the classic seven layer bars, but these are all dressed up for fall! A gooey, chewy, easy fall dessert recipe! Pumpkin season is in full swing, and I have been baking up a storm with my five little helpers lately (ok, we do this on the regular, but now we do it with pumpkin!). Today’s recipe is a new take on an old favorite – with a twist! 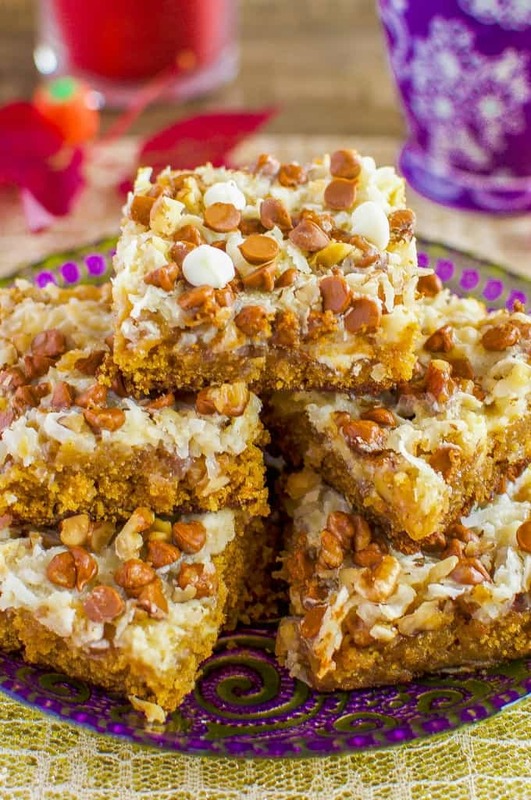 The original magic bars start with a graham cracker crust, but these magic bars start with a pumpkin spice blondie! And that’s only the beginning! If you haven’t been around Back for Seconds long, let me fill you in on a little secret: I love bar desserts!! I wrote a cookbook dedicated to them ( get your copy of Brownies, Blondies, and Bars on sale here), and I just love how easy they are to make! It’s also really easy to take a basic bar recipe from simple to show stopping! I just can’t quit with the brownies, blondies, and bars. I hope you don’t mind! 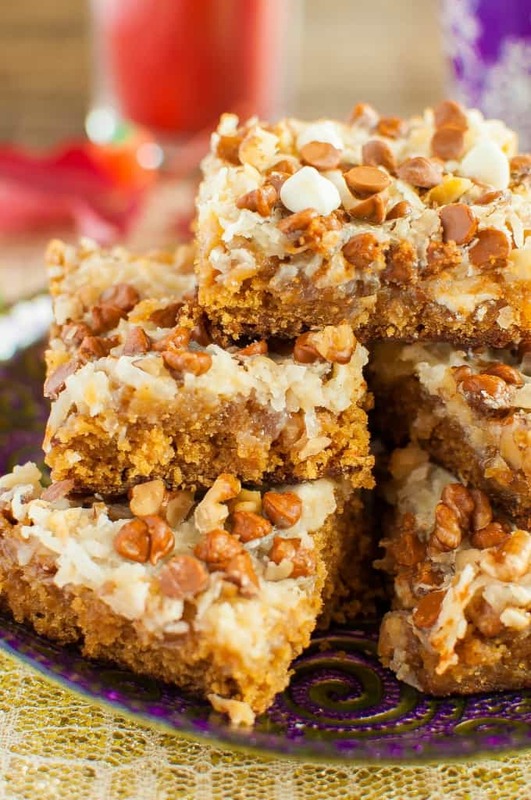 There is some serious fall/holiday flavor going on in these magic bars. 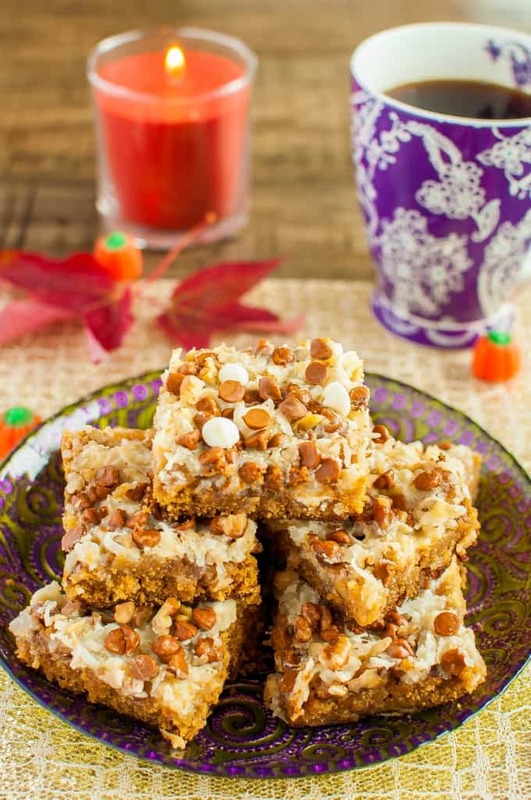 Pumpkin spice blondies topped with coconut, cinnamon chips, pecans, (I used walnuts in the ones pictured, but I prefer them with pecans. Use what you like best.) white chocolate, and the magic ingredient – condensed milk! Chewy, gooey, pumpkin spice deliciousness! Enjoy! stores like Walmart, Kroger etc. don’t seem to carry them anymore. Gonna try these….what’s not to LOVE??!!! I ordered cinnamon chips online when I couldn’t find them locally! Several purveyors on the internet, at reasonable prices. Thanks for sharing. I have made the pumpkin spice magic bars with chocolate chips also. They are delicious too. Thanks for the dark chocolate cranberry Magic Bar recipe. I can’t wait to try them.